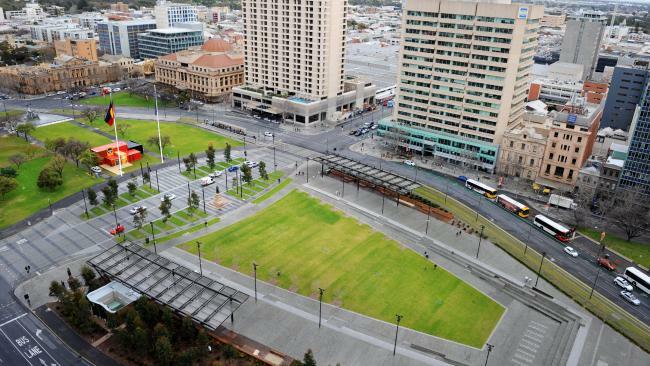 ANOTHER day, another news report that Adelaide City Council is stuffing around with Victoria Square. Or actually, to be totally accurate, no longer stuffing around with it. In fact the latest news on Adelaide’s square-that-isn’t is that the council can’t afford to finish stuffing around with it. After the council spent $28 million on ripping out trees in the northern half of the square and replacing them with pavers and big metal awnings that do a good impression of an umbrella that’s lost its fabric, Lord Mayor Martin Haese has deemed the further $70 million required to develop the southern half “gross over-capitalisation”, and has summarily canned the idea. And so there will be no stage two of the two-stage redevelopment — either figuratively or literally, as the entertainment area that was planned there will no longer take shape. We’ll also miss out on the “mosaic garden”, with its gravel pathways meandering through unshaded patches of shrubs. Gone are the sustainable gardens and wetlands, outdoor cafes and “cultural and function centre”, whatever that was going to be, although we did score an “interactive water feature”, which I think is council speak for “some fountains”. I think the interactive part is that you can stick your hand in them and watch it get wet. In what is now an excellent visual metaphor for the term “half-arsed”, we are now left with a square that’s had half a facelift — one side all tarted up with concrete and spak filla filler and the other looking a bit 1970s and droopy, like some sort of urban stroke victim. Maybe we can tell people it’s supposed to be demonstrative of Chinese design principles, yin and yang and all that. There is one silver lining: by leaving the southern side alone we will at least retain some of the square’s trees, something I railed about in my last column on the redevelopment in November. “This will be you again in 20 years, whining about the same thing,” someone called Jon complained in a comment on that piece at the time. This is probably true, mainly because I’m fairly certain that in 20 years we’ll all still be debating what to do with the place. It seems Victoria Square is destined to be my “rosebud”; years from now on my deathbed I will shout “STAGE TWO!” just before I cark it and confuse everyone for generations to come. The thing is, we Adelaideans are entitled to feel a bit miffed that after decades of discussion and money spent on endless consultations and planning, we have ultimately paid almost $30 million to put some pavers down and move a fountain from one end of the square to the other. Incidentally that seems to be one of the council’s favourite things to do — move Adelaide landmarks a few metres in an arbitrary direction. Like the Rundle Mall balls, canopy and fountain, which were all shoved about a bit for no particular reason. Is it something to do with Feng Shui? But miffed as we may be, Mayor Haese is absolutely right to call time on this badly designed, exorbitant development dreamt up by his predecessor Stephen Yarwood. Given construction was started without a full budget to back it up, none of us should really be surprised it’s come to this. Now with the state’s kitty looking ever more anaemic it seems unlikely anything will happen with the place for a long time. First published in The Advertiser, August 6, 2015. Click here to read original article.